This guide and everything we do at the ACA is in support of you being brave and fearless, increasing your confidence and getting your business off to the most successful start possible. If you find it helpful or you have questions not addressed, please do let us know! Does this allow you to work from home? When someone asks this question, it's usually an indication they are not understanding some important distinctions. If you are looking for work-from-home employment, you want to search under the term "telecommuting" or "work-from-home jobs." An Administrative Consultant is a solopreneur who works personally with clients in a collaborative, one-on-one relationship of ongoing administrative support. We're the administrative experts who keep our clients' businesses organized, humming along smoothly and moving forward. I see conversations in our industry occasionally where it's clear some people don't understand our use of the term "consultant." They mistakenly think all consultants do is advise. Someone who provides administrative support is not a generalist. Administrative support is a profession, specialization, expertise and category of business in and of itself. It is NOT web design, bookkeeping, graphic design, desktop publishing, marketing, et al. Those are separate professions and specializations that entail their own distinct training, talents, skillsets and processes. Administrative support is not project work. A company that is in the business of piecemeal tasks and project work is called a secretarial service, which is the opposite of administrative support. Though they might provide additional services and project work, Administrative Consultants are first and foremost in the business of providing ongoing, continuous administrative support in personal, one-on-one partnering relationships with their clients. An Administrative Consultant is NOT a virtual assistant. "Virtual assistant" is a term of employment, not business. And when you run a business, for both legal and practical reasons, you are never anyone's assistant. An Administrative Consultant is not an online business manager. Although they provide actual support and can also provide administrative advice and guidance to clients, Administrative Consultants do not manage the client’s business. They are instrumental in helping clients achieve success and accomplish their goals, but clients are always responsible for managing their own business and their own business’s success or failure. Administrative support is a niche, specialty, expertise and profession in and of itself. Administrative support is also an ongoing relationship, not a one-time or occasional drive-by purchase. Strategic administrative support, therefore, must also be delivered on an ongoing, continuous basis. The results clients want to achieve aren’t accomplished working together sporadically on a piece-meal or one-time project basis. By working in ongoing, one-on-one collaborative partnership with an Administrative Consultant, clients get someone whose knowledge and understanding of them, their goals, how their business works and what’s important to them grows ever increasingly the longer they work together. That’s what administrative support is all about, and what gives clients the greatest business-strengthening value and results. If you are looking for a work-at-home job, this is the wrong place for you. What you need to be searching for instead is telecommuting. A telecommuter is someone who is an employee of a company who performs their job remotely (usually from home). That’s not what Administrative Consulting is whatsoever. It’s important to clarify and make sure you understand this because there are legal implications involved. I see many newcomers to the industry confused about what they are. They see terms like “self-employed,” “independent contractor” and such bandied about and it causes them to think they are a sort of telecommuting employee. This is completely incorrect. There are only two classifications in business: someone is either an employee or they are in business. There is no third classification where someone works like an employee but is paid like a contractor. If someone is an employee, regardless of whether they telecommute from home, the law requires their employer to report and pay taxes on them just like any other employee. Failure to properly classify employees carries severe penalties and other consequences—it’s called misclassification of employees. This is why if you are in business, you must operate and work with clients like a business. Independent contractor is merely another term for business owner. That’s all. You will not be working with clients or be available to them in the same way you were as an employee. By law, they may not dictate your schedule nor how, when or where you perform your services. It’s very important that you bone up on this area of the law as a knowledgeable, responsible business owner. You can learn more about the difference between an employee and independent contractor at IRS.gov. Business ownership can be an absolutely wonderful adventure and way of life. There’s nothing like being your own boss, setting your own hours, and doing work you love with only people you enjoy working with most. Being a business owner, you are in control of your fortunes and creating the quality of life you want for yourself. That said, business ownership isn’t for everyone. Some simply don’t have the proper mindset, constitution or expectations. For that reason, it’s important that you go in with your eyes wide open. It’s not a get-rich-quick scheme. You’re not going to become an overnight millionaire. (If it were that easy, we’d ALL be millionaires, lol.) It takes time and effort to establish a business and become successful. Know that going in. You must be highly self-directed and motivated. There isn’t going to be anyone telling you what to do or when. You’re the one calling the shots now so it’s up to you to make things happen in your business. It’s going to be work, a LOT of work. If you don’t like hard work and think everything should be handed over to you on a silver platter, you better quit now. You need a thick skin. You’ll get rejected. A lot. You’re also going to make a lot of mistakes. You can’t beat yourself up over those times. In fact, you want to embrace those experiences because they’re actually very necessary to your business growth and learning. Understand that if you are shy, you're going to need to get over that. Although this is a business where we typically never meet clients in person, that doesn't mean you can hide behind your computer. Clients and work aren't going to drop into your lap by magic. You need to put yourself out there to market and TALK to actual people as you go about networking and conducting consultations. So, you'll need to come to terms with the fact that being in business is going to require you to step outside your comfort zones. 5 years minimum administrative support experience in the real world. Great communication skills in both writing and talking with people. Exceptional organizational abilities. These will be critical to your client, workload and business management. Keen powers of observation. You need to be someone who pays close attention to cues, signals, instructions, details, subtext, etc. Proactive, business mindset. This is a business, not a job. Employee mindset has no place here. You can’t sit like a lump waiting to be told what to do. You must take charge and lead your own processes. Is this kind of business profitable? Any business can be profitable and successful. It all depends on the business owner and how smart they are in operating their business and working with clients. As Dr. Phil says, “you can’t fix what you don’t acknowledge.” The fact is most people in this industry are not making any money to speak of. We have been conducting an annual industry survey since 2006, and our results show that most are making less than $10,000 a year. They work with clients as if they were still employees instead of strategic support partners. They take on unideal and/or anchor clients who monopolize all their time and prevent them from having the room to work with others. These are ALL things which can be rectified and that you can do differently in your business to make it a financial success. Just by reading this guide, you will be raising your business consciousness to avoid many of these pitfalls. Save your money for business products and education, and skills training. Those will be far more valuable and relevant to your growth and success. See my blog for more information on industry certification. You should already come to the industry and business with a professional level of skills and qualification. That only comes from having administrative support experience in the real world. That’s the basis upon which you start your administrative support business. 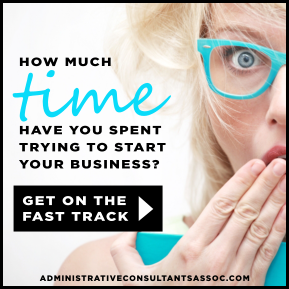 You have to rememember, being an Administrative Consultant isn’t a job. It’s a business. You wouldn’t start a construction business without knowing already what you’re doing, right? Same idea. You can’t sell a service you have no expertise in and the industry and your colleagues expect you to have the appropriate experience as a matter of professional standards. If you aren’t trying to start a business, then what you are really looking for is telecommuting. Telecommuting is where you are employed by a company but work remotely from home. But again, most staffing firms still need you to have experience or you simply aren’t going to have the skills needed to adequately support clients and make them happy. Their business and work is important to them. They don’t want their time wasted and they don’t want to pay to be your guinea pig. The very first step in your business journey, before you do ANYTHING else, is starting your business plan. It’s important to point out that a business plan is not solely for the purposes of obtaining funding for your business (i.e., some people think a business plan is solely for trying to obtain business loans or investors). In fact, the MOST important reason for doing a business plan is that it forces you to get clear about why you are going in to business, what your goals and challenges are, how much money you would like to earn, etc., and then formalizing the map for how you plan to get there. A business plan does not need to be pretty (unless you do intend to use it to secure bank or investor funding; then it really does need to follow a specific, standard format). And, understand that it will be always be a work in progress. It’s a good idea to make an annual date to sit down with your business plan, evaluate your progress, and then document and incorporate those updates and changes in strategy. RESOURCE: One thing we’ve done to make your life easier is provide you with an Administrative Consultant Business Plan Template. Not only will this template help you understand the business better and provide you with a model to adapt for your own business, it is presented in proper business plan format should you ever decide to use it for formal funding purposes. Licensing and registration requirements vary widely from place to place. Your particular city, county and state may require you to obtain business licensing and/or registration in order to operate within their jurisdictions. You will need to research and check with each of the governing bodies in your own locale to find out which require a license and/or registration in order to operate legally and how often it must be renewed. If you are in the United States or a U.S. Territory, you will need to obtain an EIN from the IRS. EINs are used as a Federal identification number to identify business entities. It doesn't cost anything to obtain an EIN and you can apply for and obtain one instantly online. For Sole Proprietors: IRS Self-Employed Individuals Tax Center. Your local city, county and state may also require you to pay business taxes on top of this. It will be your job as a new business owner to contact the appropriate tax and licensing departments for each of these governing agencies to determine what the business tax reporting responsibilities and schedules are for your location. Set aside 30-50% of every dollar that the business earns. Do this instantly the minute the money comes in. Open a separate account for these taxes monies so they don’t co-mingle with your other funds. If you can automate or make this process more convenient in any way (e.g., online banking), all the better because you’ll be more diligent about. This way, you will never be caught without funds come tax paying time, and you will save yourself a whole host of penalties and interest, not to mention stress and worry. There are several options to choose from when it comes to business formation (e.g., sole proprietor, S-Corp, LLC, etc.). Each comes with its own set of pros and cons. For example, a sole-proprietorship is the easiest business to run. However, it also has the greatest liability exposure for your personal assets should you ever be sued by a client. Incorporating in some manner will give more personal asset protection and may even reduce the amount of taxes you pay. You get an Intro to Business Formations to help you understand the different types when you purchase the Administrative Consultant Business Plan Set from the ACA Success Store. Insurance is another area where it all depends on your particular circumstances and business. You will really need to talk directly with an insurance provider in your area to get the most pertinent facts for you. However, I have a section in my blog on Insurance that will shed some light on things before you start making your calls. One of the most important administrative functions in your business is bookkeeping. Don’t sluff off on this, and don’t cheap out. Spreadsheets or pared-down software alternatives like Quicken just aren’t going to cut it. And to be all woo-woo about it, your relationship with money is going to have a lot to do with how well you do in business. If you want to do well financially, take good care of your money. That means investing in the right tools and support. If you know bookkeeping and want to do this yourself, my best recommendation is Quickbooks Pro. It’s full-fledged, professional-quality software that’s relatively easy and intuitive to use and makes bookkeeping a breeze. One of the best reasons to use Quickbooks Pro is the reporting feature which allow you to budget, forecast and see exactly how you are earning. With this information, you can easily identify who are your best clients and most profitable accounts, and make decisions accordingly (e.g., who to let go, what to focus on more, etc.). If you do not know bookkeeping, hire someone who does. I can’t tell you how important this is to your business, and it will make your life so much easier. Any fees you pay are a tax write-off and you will thank yourself profusely for doing things right, right from the get-go. Whether you plan to do your own bookkeeping or have someone else do it, be sure and purchase the Bookkeeping Set-Up Form. This tool captures and organizes all the information you need, in the order you need it, to enter into Quickbooks. Your #1 job in marketing is building trust. And displaying a business address and phone number are two vital trust components. When you don't display either of these, people wonder what you're hiding. BUT, for personal safety and privacy reasons, it's not a good idea to use your home address. Here are 5 options for obtaining a business mailing address for your website. One of the most common questions in our industry is “How much should I charge?” The first thing you need to know is that no one can tell you what to charge. It’s against antitrust laws. It’s really something you have to come up with on your own based on what your business needs to earn, and what you feel fairly compensates you for the value of your time, talents and expertise. Pricing is a field of study unto itself. Your pricing has a lot do with your marketing, the message it sends about you and your service to prospective clients, as well as what kind of clients it attracts. It’s something you will continue to learn about and refine throughout the life of your business. How much does the business need to earn to pay for overhead and expenses and be self-sustaining? What do you want/need to earn personally over and above that? Does the fee you charge allow you to be profitable? That is, not just sustainable, but bring in an excess with which you can save and have extra left over after business expenses and your salary? Because hand-to-mouth earning is just surviving, not thriving and being profitable. Profit is what allows you to create savings, take vacations, buy a home, a car, pay for education, etc. Does the fee honor your worth? Is it in keeping with the value and expertise you bring to the table and the results that clients benefit from? Does your pricing position you properly? You may have not even realized that your pricing is actually a part of an effective marketing strategy. If your fee is too low this sends a negative signal to prospects and clients that your quality and skill may be subpar and draws the wrong/unideal clients to you. Charging the same as everyone else can be just as detrimental as it says there’s nothing special or different about you. A great fee is one that not everyone can afford (which helps weed out the cheapskates, deadbeats and other unideal clients) and is just high enough that it sends the message that you are better and more skilled, expert and worthwhile than the average bear. Yes, absolutely, positively! I can't stress this enough: in this day and age, a website is a must. You can’t always rely on referrals or word-of-mouth marketing to get clients. And no matter what, you are a human being who needs to sleep. It’s simply not humanly possible to market and educate clients 24 hours a day, 7 days a week, 365 days a year. But your website can! The fact is, most people like to get as much information about you and your business as they can on their own before they ever decide to contact you. So, if you don’t have one, but your competitors do, guess who they’re going to first? It’s just smart business to have a website all the way around (especially one that you utilize as an extra right-hand assistant). A website isn’t just a brochure for your business. It acts as your online reception area, central information repository, PR agent, sales force, marketing assistant, customer service rep, resource center and tour agent all in one! Done properly, its job is to educate, persuade, disseminate information, resources and tools, set the right expectations and perceptions, and excite potential clients into wanting to meet with you to learn more. A great website will cut your own personal marketing and client prequalifying efforts down by half, and make them much easier and more effective. This isn't as easy a question to answer as it seems. That's because one person's needs and preferences in software are not necessarily going to be the same as the next person's. It's also matters who your clients are and what profession/field/industry they are in (this is called a target market). For example, someone who works with attorneys may need specialized practice management software, whereas someone who doesn't won't need that at all. You see? RESOURCE: Here's a blog post with some basics that will be helpful in getting started: Dear Danielle: What Software Do I Need for an Administrative Support Business? How and where do I market myself and my business? How/where will I find clients? The best way to determine where and how to market is to first decide who your audience will be. This is what is called a target market. And a target market is simply a field/industry/profession that you decide to cater your administrative support to. Once you have a target market in mind, that will give you the direction for where to find those people (online and off) who are it so that you can begin meeting them, interacting with them and learning more about their industry and businesses. This in turn helps you create a compelling marketing message and hone your offerings in way that will be most attractive and meaningful to them. What services are best to offer? As far as what services to offer, here's a different way to think about this that I think will be more helpful and clarifying for you. I always like to say that administrative support IS the service. What that support might be comprised of depends on your target market. So here again is where a target market is so helpful. Once you know what industry you're catering your administrative support to, it's easier to identify what support will be most relevant, meaningful and useful to them. The support you'd provide to one industry will not necessary be the same as the next which is why it's so important to know who you're focusing on. RESOURCE: I have a whole blog category on this topic that you'll find helpful in understanding how to look at and market administrative support (which is ongoing, not ad hoc like a secretarial service): What Services Do You Provide? Do I have to pay taxes even if I'm only going to work in this business part-time? Yes, a business is a business regardless of how much or how often you work in it. If you get paid, you have to pay taxes. Refer back to the previous Taxes section above. As someone who is in self-employed business, you are now both worker and employer so you have to pay both sides of those taxes. Refer back to the Taxes section above for additional information. For a crash-course in how to pay yourself and self-employment taxes and reporting, see my blog post on the topic: Dear Danielle: How Do I Pay Myself?